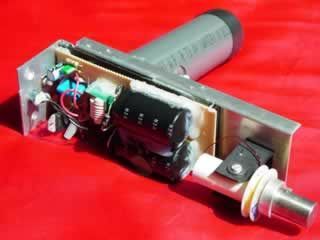 Whilst searching for Rail-Gun photos and information, I came across this Pulse Rifle from www.americanantigravity.com below is the details off their site relating to the rifle. ====================================================== The EM pulse rifle is one of many related designs based on the idea of accelerating a projectile to high-velocities using electromagnetic energy Unlike a railgun, which requires high input-energy and is based on a Lorentz-force rail-accelerator, the Pulse Rifle utilizes an inductive acceleration on a non-magnetic projectile. In short, the device discharges a capacitor-bank through a magnetic coil situated directly behind a 1-inch diameter aluminum ring. The brief but powerful magnetic pulse generates an inductive-current in the ring, which then accelerates down the barrel at high speed. Information Unlimited is also testing a more powerful version of this design that fires a conventional projectile, but the ring has been used in this case because it has more surface area (and hence is less dangerous) than a smaller projectile is. The pulse-rifle prototype is powered by 4 AA batteries, and requires about 1 minute to charge between each shot. It fires at about the same velocity as a BB-gun, and has a much greater efficiency than similar designs tested by the military. 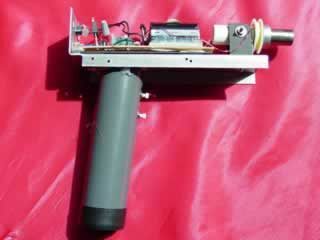 This particular protoype is not considered a weapon due to the low muzzle velocity and 1-minute charge-time.